Biofeedback potentially provides non-invasive, effective psychophysiological interventions for psychiatric disorders. The encompassing purpose of this review was to establish how biofeedback interventions have been used to treat select psychiatric disorders [anxiety, autistic spectrum disorders, depression, dissociation, eating disorders, schizophrenia and psychoses] to date and provide a useful reference for consultation by clinicians and researchers planning to administer a biofeedback treatment. 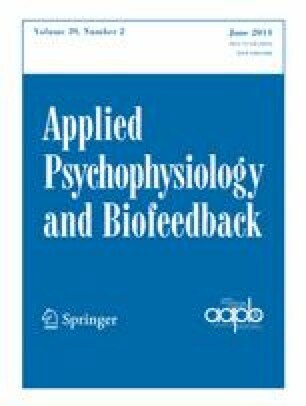 A systematic search of EMBASE, MEDLINE, PsycINFO, and WOK databases and hand searches in Applied Psychophysiology and Biofeedback, and Journal of Neurotherapy, identified 227 articles; 63 of which are included within this review. Electroencephalographic neurofeedback constituted the most investigated modality (31.7 %). Anxiety disorders were the most commonly treated (68.3 %). Multi-modal biofeedback appeared most effective in significantly ameliorating symptoms, suggesting that targeting more than one physiological modality for bio-regulation increases therapeutic efficacy. Overall, 80.9 % of articles reported some level of clinical amelioration related to biofeedback exposure, 65.0 % to a statistically significant (p < .05) level of symptom reduction based on reported standardized clinical parameters. Although the heterogeneity of the included studies warrants caution before explicit efficacy statements can be made. Further development of standardized controlled methodological protocols tailored for specific disorders and guidelines to generate comprehensive reports may contribute towards establishing the value of biofeedback interventions within mainstream psychiatry.